A 28-year-old man has been charged with drunken driving after crashing his motorized bar stool, Ohio authorities said. Police in Newark, 30 miles east of Columbus, say when they responded to a report of a crash with injuries on March 4, they found a man who had wrecked a bar stool powered by a deconstructed lawn mower. Police released the 911 tapes, revealing the calm exchange between the driver's friend and the dispatcher. "I got a friend who wrecked a bar stool," the caller said. When asked by the dispatcher whether he hit his head inside the bar, the friend replied, "Um, no, he was riding the bar stool ... a motorized bar stool." Kile Wygle, the bar-stool rider, was hospitalized for minor injuries. During an interview after his crash, Wygle told the reporter, "I drank quite a bit after I wrecked. Police say he was charged with operating a vehicle while intoxicated after he told an officer at the hospital that he had consumed 15 beers. 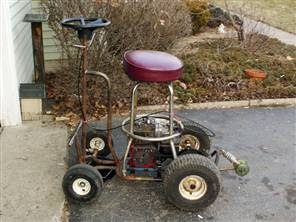 Wygle told police his motorized bar stool can go up to 38 mph. Wygle has pleaded not guilty and has requested a jury trial. Those might be the two greatest contributions in the history of the Law Blog. I don't remember the last time I laughed that hard. I've seen those videos before...and I laugh every time!